I saw a cute gum ball jar on a friend's Facebook page the other day and I couldn't resist, I had to make my own version. 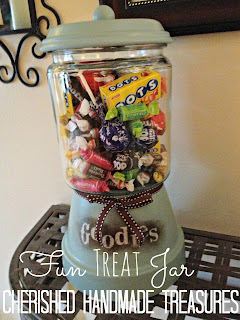 This treat jar is made from a terra cotta pot and an inexpensive jar. Filled with some candy, or whatever you prefer. 1. If there are any rough on the flower pot and saucer, file them with sand paper or an emery board (my personal choice for small jobs). Then glue the wooden ball to the bottom of the drainage saucer. 2. Paint the pot and saucer the color of your choice. 3. I also decided to add a coat of antique matte Mod Podge. This step is optional. It's hard to see in the photos the difference this made, but I thought it added just the right touch to the color. 4. This is after the Mod Podge step. You can see how it yellowed it out a bit along the edge. 5. Add your stenciled word(s) to the front of the jar and using a clean sponge and your choice of ink, blot over the letters. For the stenciled letters, you can use a Cricut or Big Shot, etc. or you can purchase them already made. Glue your jar to the bottom of the flower pot. Tie the ribbon around the middle. 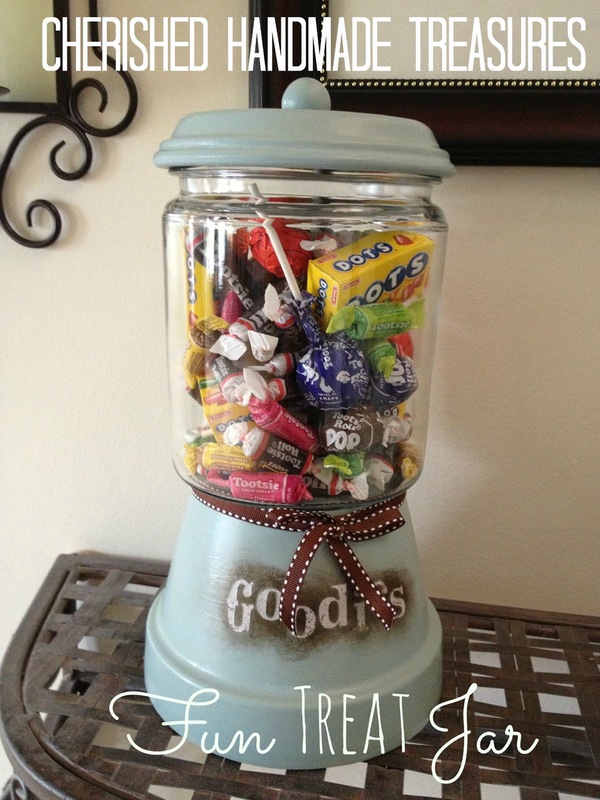 Fill with candy and put your lid in place. Voilà! 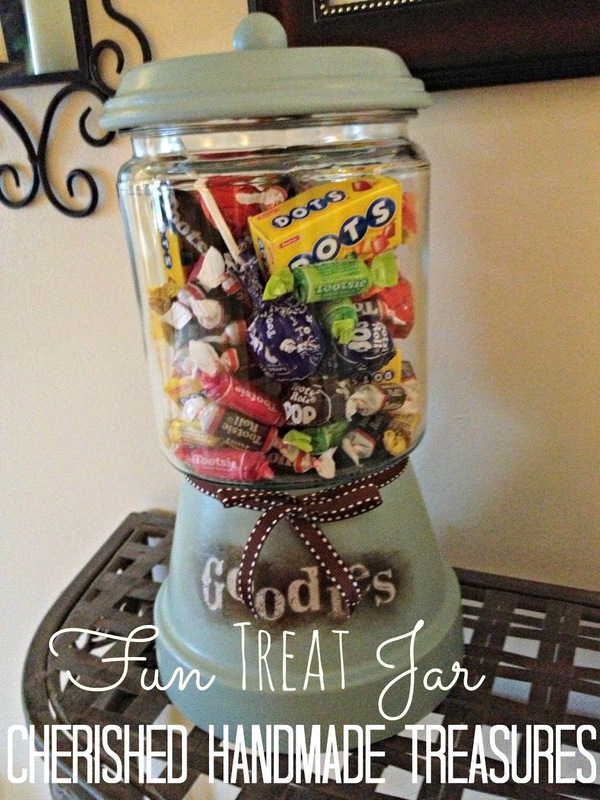 A fun treat jar made for only a few dollars. This is so cute and simple - Great job! Love your jar! I have a jar that would be perfect for this, just need to get some pots! If you make it up, I would love to see it. I hope you will link it up to the Creative Corner Hop once it is finished. A truly beautiful treat jar! You did an awesome job! This jar is adorable! I love the font you used - and how you used negative space instead of just slapping some vinyl on it!! We'll be featuring this at Someday Crafts tomorrow, so come on over if you have a minute! Better job of these pots, than I have seen. Thank you much. Just asking...how do you make sure the jar is sealed? Won't critters, like sugar ants, be tempted to make themselves at home?